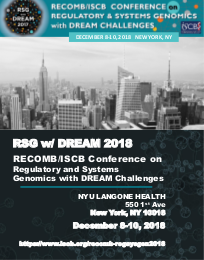 The RECOMB/ISCB Conference on Regulatory and Systems Genomics with DREAM Challenges (RSG w/DREAM) presents the latest findings in regulatory and systems genomics, fosters discussion about current research directions, and establishes new collaborations that advance the development of a systems-level understanding of gene regulation. Sign up to Become Sponsor or Exhibit! Click here for online form.